The paper presents the research results of shape errors and roughness of driveshaft cross-piece journal surfaces in cut-in cenreless grinding in accordance with the coolant composition and its supply scheme into the grinding area. The results will provide increasing the quality of driveshaft cross-piece journal surfaces. 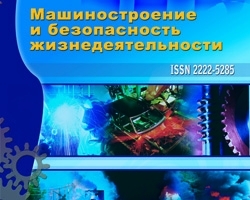 The dependence of shape error change and specification on roundness and cut are considered in the course of the research work as well as ground surface parameters (Ra, Rz) depend on the coolant composition and its supply scheme to the grinding area in cut-in cenreless grinding of driveshaft cross-piece journals. The paper considers the influence of emulsol, which is a water solution, and NGL-205 coolant on developing the shape roughness and error parameters in centreless grinding. Roughness parameter measurements are conducted with the use of profilometers-profilers of various designs. Shape error parameter measurements are performed using bore gages when recording polar diagrams followed by their processing. The results of the research have been implemented in manufacturing driveshaft cross-pieces. Keywords: shape errors, roughness, centreless grinding, cross-piece, composition, coolant supply scheme.